At the end of this month, some people will have the opportunity to see a moon that is both a red moon and a blue moon. Of course, it will be a figurative blue moon but a literal red moon, the latter caused by a total lunar eclipse. Neither lunar eclipses nor blue moons are actually that rare. This month’s will be the eighth total lunar eclipse since 2010 (although unfortunately not visible from most of Europe this time) and indeed there will be another one in July. As for “once a blue moon”, that is usually taken to mean not for a very long time. However, these days, a blue moon is usually defined as the second full moon in a month, and that isn’t actually so rare either. In fact, there will be another blue moon in March! There is some uncertainty as to the exact definition of a blue moon. Some sources say it occurs where there are four full moons in a quarter of a year (in which case, “blue moon” refers to the third one). Using this definition, there have only been three blue moons since 2010, and the next isn’t due until 2019. This month’s event also coincides with a so-called “super moon” where the moon is closer to the Earth, so appears bigger. A super blood-red blue moon. Lunar eclipses and blue moons both necessarily occur when there is a full moon. Both occurring together is far more unusual, though. 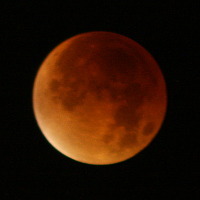 The last time there was a total lunar eclipse coinciding with a blue moon was on 31 March 1866! Perhaps the expression should be “Once in a red and blue moon”. However, for those of us unable to see this rare phenomenon this January, there’s no need to wait 150 years. There is another one due in December 2028!